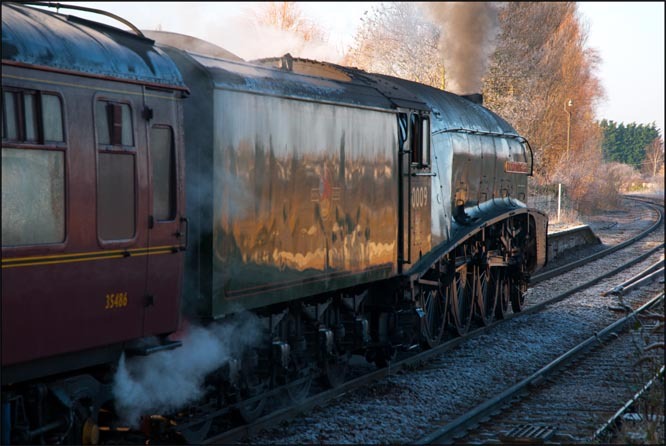 A4 Union of South Africa was at March on 13th December 2012. The train was The York Yuletide Express from Norwich to York.At March it went into the into the loops in the south yard to take on water it then came into March station to pick up passengers. It was a very cold morning with heavy frost but with some sun. The video below is of A4 Union of South Africa was at March on 13th December 2012. The train was The York Yuletide Express from Norwich to York.